For years, gender roles have impacted what jobs men and women pursue. The Volante talked with three male students who’ve entered majors that are primarily pursued by women or often stereotypically thought of as feminine. 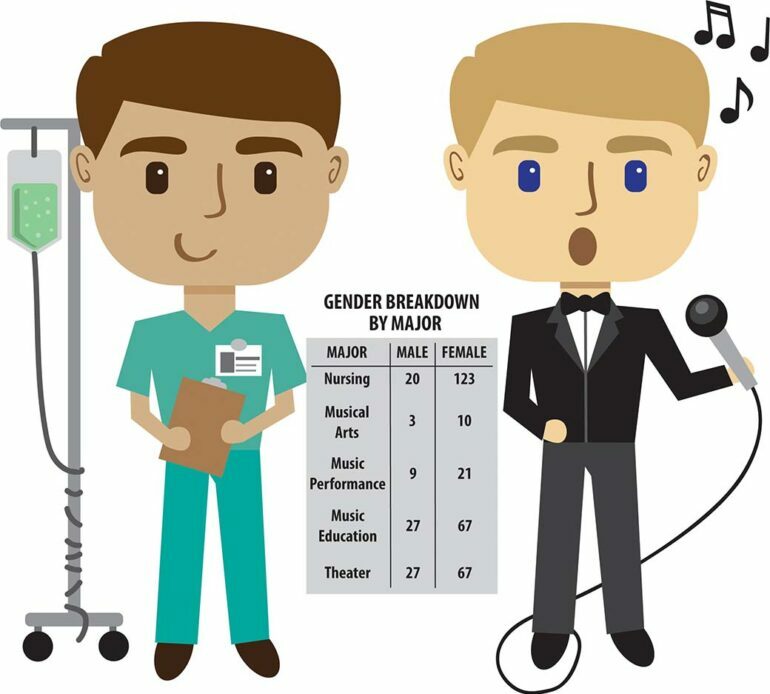 According to the United States Census Bureau, only nine percent of nurses in the U.S. in 2011 were male. A lifeguarding class showed junior Steven Howell the benefits of working in a medical field, he said. When it came time to decide his major, nursing presented itself as a career with great potential, he said. Howell made the move from the Chicago suburbs to USD so he could participate in swimming and major in the nursing program. He believes gender shouldn’t matter as long as people are compassionate, have patient-centered care and possess critical thinking skills. “It’s a field where you have to kind of open up and you have to be sensitive to other people,” he said. Regan Luken, a nursing faculty advisor, said it’s important to have diversity in the field of nursing in order to provide better care to a diverse population. “The times are changing, and so we’re seeing more and more men in nursing nationwide,” Luken said. Howell said his biggest challenge has nothing to do with gender – it’s balancing 20 hours of swimming practice a week and his heavy workload in the nursing program. After graduation, Howell said he hopes to move back home and get a job working in an ER unit. Fifth-year senior Braeden Garrett has been involved in theater since he was three years old. Garrett is a musical theater major and dance minor. He said it makes him happy to be involved in something that’s sometimes perceived as abnormal for men. Theater chair Raimondo Genna said if everyone followed gender stereotypes, a lot of talented men and women wouldn’t have contributed to theater. After watching his father perform in a production at a young age, Garrett said he decided he wanted to be just like him. Because of his father’s influence, the stigma that men shouldn’t do theater because it “isn’t masculine” never impacted his major and career choices. “You don’t really notice a big difference in men to women because you’re not really focusing on that as much as you’re focusing on your career,” Garrett said. Garrett came to South Dakota from Washington to be part of USD’s theater program. In his final semester, he said it feels good to push the boundaries of stereotypical gender roles. “If you have a passion, just follow it,” he said. After graduation, Garrett plans to go back to Washington and audition in Seattle for cruise lines. After that, he’ll go to New York for audition season for Broadway shows and commercials. Eldon Warner, a junior from Council Bluffs, IA, said he chose USD so he could participate in track and music performance. Growing up with a grandma who was a music teacher and a dad who played the drum set, Warner said the musical influence throughout his life impacted him. He said he encourages everyone to follow their passion despite gender stereotypes, because there are always roles that need to be filled. Music chair David Holdhusen said he likes to see men inspire one another in the program. “Once they get in there and they’re in a comfort area, then they can really grow and learn what it means, and then hopefully inspire the musicianship of the younger students,” Holdhusen said. Holdhusen said an increase in men majoring in music would be beneficial to USD and the state, and would be better for the overall growth of music in the country. Warner said he likes to meet other men majoring in music. He said he enjoys finding people with the same passion and love for music. “I truly find myself most happy when I’m doing music,” Warner said. After graduation, Warner said he’ll look for a graduate program in a place where opera programs are more prominent. This is part one of a two-part series on gender stereotypes. Next week’s issue will include part two, which will feature women in majors traditionally pursued by men.